Automotive aficionados have helped shape the car industry we see today, men and women who possess a passion for speed, styling, engineering and technology. Without their exuberance and particularly their “need for speed,” today’s cars wouldn’t be much faster than a horse-drawn buggy, utilitarian devices engineered to move people from Point A to Point B.
Happily, that restrained way of driving never caught on. Instead, we have at our disposal some of the most sophisticated pieces of equipment sitting in our driveways, motorcars that have been greatly impacted by those who have a passion for driving. 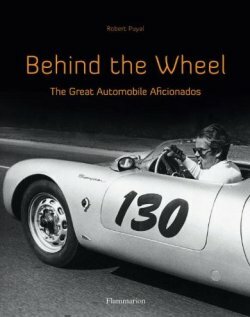 Author Robert Puyal has captured the people who have shaped or are still fashioning the automotive industry today in his eye-catching coffee table book, “Behind the Wheel: The Great Automobile Aficionados” (2010 | Flammarion). Scheduled for release this October, I was presented with a review copy and have been taking it in ever since. First, let’s examine some background information about the author. Robert Puyal is a journalist and car specialist, a Frenchman who writes for several motorsport magazines in France. Puyal focuses on the history of the automobile as well as design, engineering and technology. His love of testing sports car is clearly evident and helps support his well researched details about the industry’s greatest and most influential drivers. Those drivers were among the “turn of the century” people who helped launch the automobile industry in the 1800s and made it a formidable industry by the 1920s. And Puyal starts off by naming five influential Frenchmen who shaped the industry–Camille Jenatzy, Camille du Gast, Louis Renault, Jules Bonnet and Jules Gout. The focus on France goes beyond Puyal’s ethnicity as his country is truly the birthplace of the automotive industry. Puyal showcases the lives of 54 individuals, documenting his information with richly supporting details and lavish black and white and, later, color photographs. The names include people we’re all familiar with including Henry Ford, Preston Tucker, James Dean, Enzo Ferrari, Brock Yates, Paul Newman and Horatio Pagani as well as a number people who were unknown at least to me. Influential as Louis Renault was in establishing his mark in the automotive industry, it seems odd that the cars sporting his name are not sold in the United States. Indeed, no French brand is currently sold stateside. Let’s get back to the list of automotive greats! Camille du Gast was the first female worthy of a mention by Puyal, a woman of considerable influence due to her marriage to Jules Crespin who founded the Dufayel department stores in Paris. When he died, Camille was just 27 years old and ready to take on the world. du Gast made a name for herself by becoming the first lady parachutist in the world; by the time she was 33, du Gast was racing cars from Paris to Berlin as well as to Madrid. Her exploits were highly unusual for her gender, with gossipers suggesting one sexual scandal after another. Undeterred, she continued to race, finishing 19th in the Berlin race with well over 100 drivers participating. Who knew that Henry Ford had a rabid racing streak? The father of the automobile assembly line broke the 100 mph barrier in 1904 when he drove a 19-liter four-cylinder Ford 999 autocar sporting a huge radiator, basic chassis, joystick and just one seat. Imagine trying to control that beast as his speed crept up, but control it he did. Later, Ford would go on to build 16 million Tin Lizzies…all in black, of course! He was a young Hollywood star and just 24 years old when he died, but James Dean was a dashing actor and cover photo feature for Puyal’s book. His love of acting quickly brought him great wealth, monies he used to purchase motorcycles first, then cars. Fast cars too including a white Porsche 356 Speedster. Dean proved to be a skilled race car driver, entering his first race in 1954 and winning his heat. But, it was a Porsche that proved to be his undoing, a 550 Spyder model involved in a fatal traffic accident near Cholame, California. In more recent years the notables have included a handful of automotive craftsmen and designers including Argentine-born Horacio Pagani. His interest in cars goes back to his early youth, telling anyone who asked that when he grew up he would build cars in Modena, home of all of the top Italian race car names including Ferrari, Maserati and Lamborghini. True to his word, Pagani took what he learned while working at Lamborghini to start Pagani, a developer of supercars of carbon construction. Each model is priced well over one million dollars, works of art that find their way into the hands of no more than 40 people around the world annually. Even if you aren’t someone who is attracted to fast cars, Behind the Wheel makes for a wonderful history lesson covering the movers and shakers who are. It is these people who have caught Robert Puyal’s attention and have been thoroughly researched by him and generously shared with the rest of us. Copyright: Behind the Wheel by Robert Puyal, Flammarion, 2010.